MICRELL® is specially formulated with a quick-acting antimicrobial agent (PCMX) to kill germs, a light scent and an effective degreasing agent that makes it perfect for foodservice environments. Its non-irritating formula also makes MICRELL ideal for frequent use in a variety of settings, including schools, health clubs, offices and recreation areas. 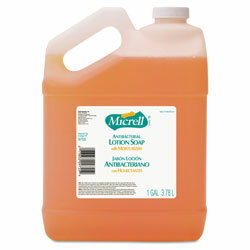 Soap Type: Liquid; Application: Hand; Capacity (Volume): 1 gal; Scent: Light. Plastic bottle is recyclable. INNER PACKAGING: 1 Bottle Per Case. 1 Gallon Per Bottle. 1 Gallon Bottled Soap from Gojo! 293 In Stock today.